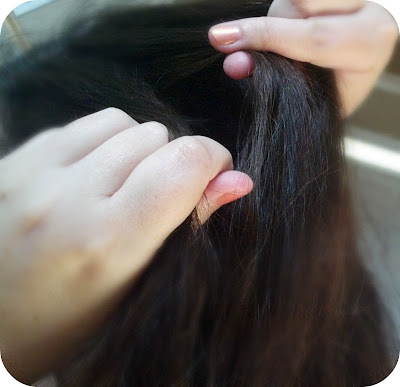 Start at the left side of your hair, taking three strands of hair, just like in a regular braid. 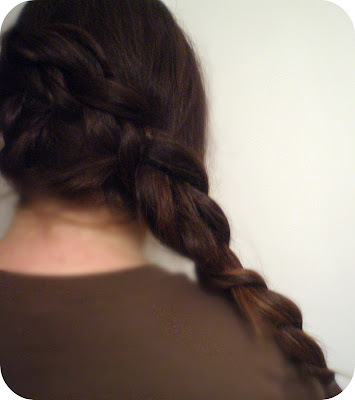 But this is a Dutch braid, which has one tiny difference--just switch the position of the middle piece of hair. Take the left piece and cross it under the middle. Do the same with the right piece. 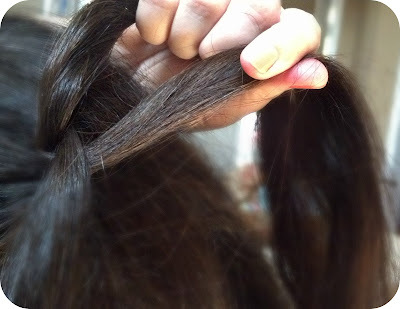 Just cross under instead of over, like in a traditional braid. Now, grab a piece of hair and add to the left piece, just like you would in a French braid. Cross under the middle. Add a piece of hair to the right piece and cross under the middle. I preferred to braid mine a little bit looser, to look closer to the braid Katniss sported. Continue working diagonally until you reach the bottom right-hand side of your head. Grab the remaining hair and braid normally. Secure with an elastic. If desired, pull some tendrils on either side of the face. That's it! Grab your bow & arrows and you're all set. PS: As part of my Reader Request Week, I'm doing a post where you can ask me anything--leave a comment below with a question or a post you'd like to see. This is gorgeous, your hair is so thick! I love how fierce Katniss is. 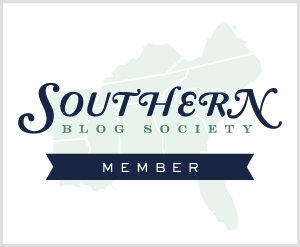 Hey, great blog! thanks for the awesome hair braiding tips! I admit, I've never read The Hunger Games. My boy is in the middle of the first one now and I'll probably borrow it after him. Maybe we'll get to see it when it comes to redbox! I was so excited to see this! 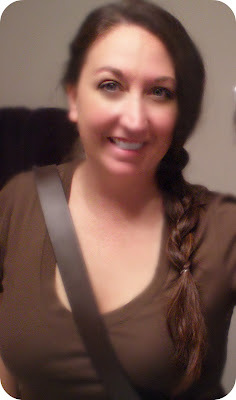 I have been trying out some new braids lately and thought this would be a cool one, but couldn't quite get it right. Thanks!! 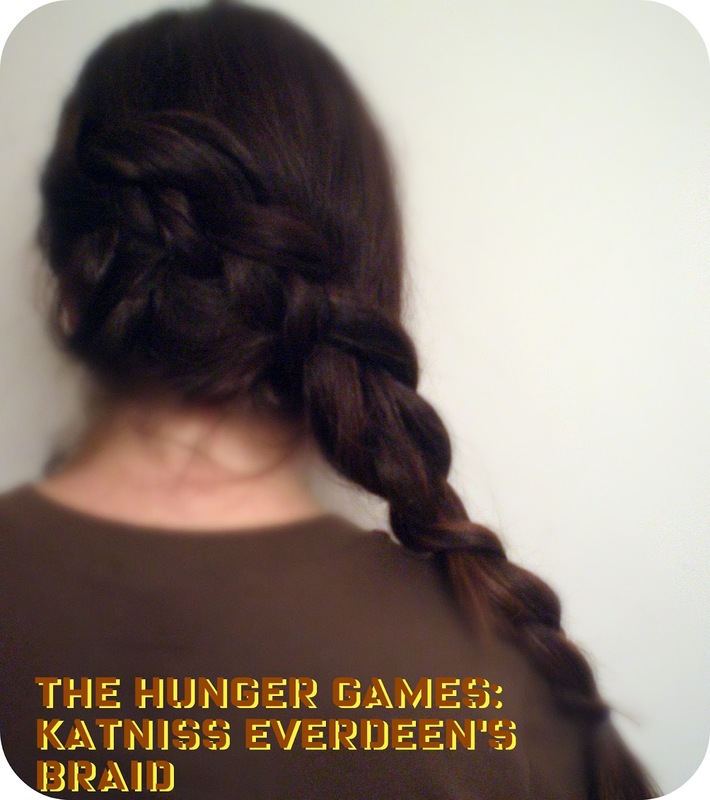 I'm still late to the Hunger Games party, but I love your hair! Oh do I have questions. Here is my main concern at the moment. Two months ago I received a bad coloring at the hairdresser's, my first dye disaster to date. Basically she left me in too long while trying to squeeze in another client, and my over-processed hair dried out, broke off, and fell out in all the wrong places. (Horrible, right?) I used to keep my hair long like yours, but now it is too limp from all the hair loss, so my NEW hairdresser and I ended up cutting off about 4 inches and praying for the new hair to grow in. My now extra frizzy hair is in a pretty fragile state so I'm trying to do as little with it as possible. Any treatment tips or easy hair-dos for the warm weather? I still need to read the book but probably won't have time until after graduation. I also love the braid trend and definitely want to try some styles in my hair! awesome katness braid! i see this being a big trend for halloween this year. Oh I love that look on you. So classy and easy too! Cute braid. I am the EXACT way! I have to read the book first before seeing the film. Its a must. I knew this was going to become a popular hair trend. So many girls were wearing their hair in braids when I went to see the movie. I do like the look on you! i am going to see it tomorrow night and i can't wait! I love this!!! Do you know that I just made two braids while sitting in my office to see this difference between a traditional braid and a Dutch braid? And then someone walked in and saw me like that. LOL. I'm the same way–I have to read the book before I see the movie! Nice! Makes me wish I didn't cut off like 3-4 inches of my hair, lol, but I had to since it was so dry and breakage-prone due to overusing protein treatments. Could you do a post on what hair products you would recommend for super dry hair? I have a conditioner I like, but I need something like... heavy duty. D: Let me know if you know of any! I'd also love it if you did a "no heat hair styles" series – I'm trying to cut back on heat styling to prevent further damage. this braid is so great! i loved it in the movie and think you did a great job recreating it. Great tutorial hun. Braids never go out of style. Awesome! You are amazing with the hair tutorials! 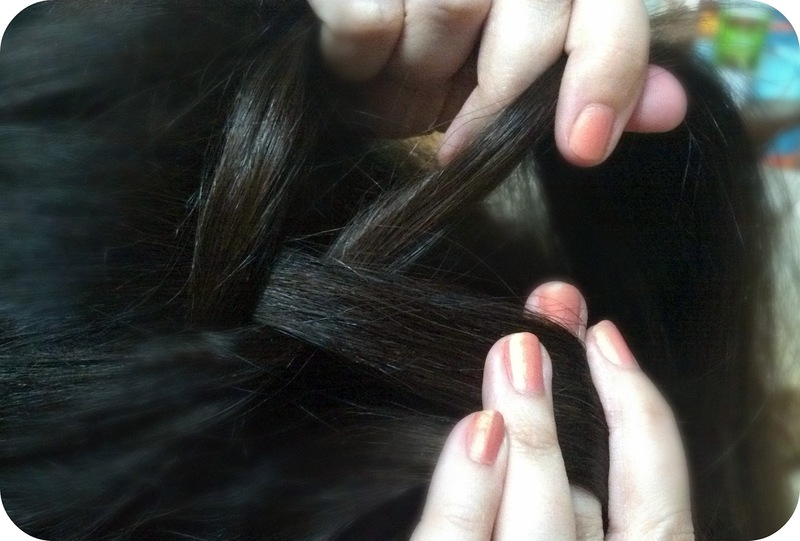 i first have to even learn how to make a french braid... haha! love it, I've been doing the same braid for years! I actually have an outfit in the queue with it! 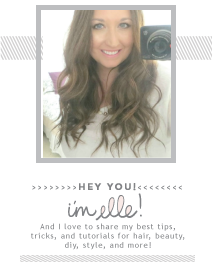 LOVE your hair tutorials! and your have the most beautiful hair! Can't wait to try this! Super cute! Love your hair tutorials. Thank you sooo much! I need a new hairstyle for the school year and this it totally it!